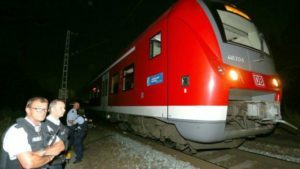 A 17-year-old Afghan refugee who attacked passengers on a train in Bavaria, Germany with an axe had a hand-painted Islamic State of Iraq and Levant (ISIL) flag in his home, police said. The 17-year-old, who a witness said shouted “Allahu Akbar” (God is Great) during the attack, severely wounded four Hong Kong residents on the train on July 18, then injured a local woman after fleeing, before police shot him dead. Germany has not been the victim of a major terrorist attack in recent years, although security officials say they have thwarted a large number of plots. Officials said the attacker was an unaccompanied minor who was registered as refugee. German Chancellor Angela Merkel’s open-door refugee policy saw nearly 1 million migrants welcomed into Germany last year. “In the minds of many people, his (attacker) arrival is directly linked to Merkel and her liberal refugee policies,” said Frank Decker, political scientist at Bonn University.